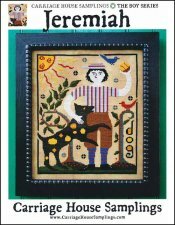 Jeremiah [W1062] - $10.00 : Yarn Tree, Your wholesale source for cross stitch supplies. Cross stitch pattern by Carriage House Samplings. Jeremiah is part of The Boy Series. This fun-loving boy is playing fetch with his dog. Stitch count 152 wide and 186 high.